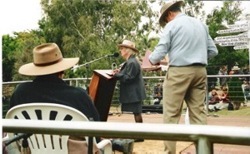 She saw this Competition advertised on the notice board in the Caravan Park at Barcaldine the morning of the Book Launch,and decided to enter.The competition was to take place at 2 pm that day, after Margaret Whitlam had performed the official Book Launch. Margaret Visciglio had no writing paper on hand, so she wrote a few notes on a sandwich bag which she, found in the rubbish bin. Margaret excused herself from the book signing line and made her way to the podium. She watched as a number of people, holding reams of paper performed their oratory. The time allotted for each contestant was ten minutes, but they all seemed to exceed that time. Margaret kept her address brief, well within the ten minutes. She suspects that it was brevity that won the day. The talk was meant to go for 10 minutes, and she took a little less than that, but the people with the reams of notes went well over the allotted time. She felt a little guilty accepting the cheque, a six pack of XXXX, two bottles of wine and a handsome plastic plaque as she had not spent a lot of time preparing for the Oration, but winning is always good. The conclusion to the question “Where does the Outback begin?” is that the Outback begins and ends in the heart of every true Aussie, and that one may travel to London, Paris and Rome, but the Outback always remains with one. 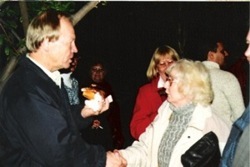 Margaret subsequently met the then Premier, Peter Beattie, over a hamburger at the celebrations which continued well into the night. "Where does the Outback begin?" The text of the Oration is reproduced below. YEAR OF THE OUTBACK, 2002. I come from South Australia. In the 1800’s a surveyor called Goyder drew a line across the State dividing the arid from the not so arid areas. My husband and I bought a four wheel drive vehicle twenty years ago and we began to explore the Flinders Ranges. 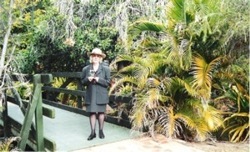 When we reached Goyder’s Line we would put on our Akubras – we were in the Outback. Since then I have travelled most of Australia. I no longer believe in Goyder’s Line – or the Black Stump - either the one at Blackall or the more pallid Victorian version. The Outback does not begin when you see the 110 km road sign or the first dead kangaroo or the first long drop loo. Where does the Outback begin? The Outback has no finite beginning or any palpable end. It is entrenched in the heart and soul of every true Australian. You can travel to London, Rome or to Paris but the Outback will go with you. The strains of Waltzing Matilda will bring a tear to your eye, and pull your heartstrings home. There can be no escape. The Outback is part of the collective consciousness of us all. Put on your metaphorical Akubras fellow Australians, and wear them with pride. If you are an Aussie you will always be in the Outback!